Cindy Fink grew up at St. John’s, and has fond memories of confirmation and Luther League. 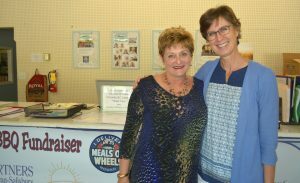 She recently returned to Salisbury, and in March was named director of Meals on Wheels. St. John’s has been involved with Meals on Wheels since its inception in 1976, and is one of the larger church teams today. Cindy came back to Salisbury last fall while she was job hunting. “The more I looked, the more I felt like I wanted to be in Salisbury more than anything else,” she says. For years, her mom was director of the food service program for the city schools. Cindy admits that she “does OK” as a cook. Clients can receive Meals on Wheels temporarily, or on a more long-term basis, Cindy says. The two requirements are that you must be a homebound senior or be disabled and homebound. Most clients, she says, are above age 60. Cindy has a master’s degree in business, and is working to develop a database to manage the program’s 200 clients and 1,000 volunteers. Meals on Wheels serves about 200 people a day, but served some 427 different people in 2016. Not only does Meals on Wheels deliver a hot meal, volunteers also come with a friendly greeting and make sure each client is safe and doing well. Cindy has enjoyed reconnecting with Carol McNeely, who serves as project assistant. Carol returns to compliment. “Cindy is energetic and inspiring to work with,” she says. Amy Ritchie and Elaine Gerst have long coordinated the St. John’s meal routes on the first and second Wednesday of each month. At present, they are looking for substitute drivers. Elaine says it’s good to have two people per route, so that one can drive and one can navigate. If you’d like to be a Meals on Wheels volunteer, Cindy would love to have you. And if you can’t come the first or second Wednesday, that’s OK, too. For more information about Meals on Wheels, call 704-633-0352. You can also register to be a volunteer online at mowrowannc.org.